Oh The Many Challenges of Placement Prints! Home/Sewing Machines/Oh The Many Challenges of Placement Prints! A great thing about crafting with sewing machines is the endless variety of beautiful fabrics available to work with. Amidst all that variety are placement prints, some of the more beautiful and unique patterned fabrics available. As beautiful as they are, these fabrics can also be a bit challenging to use in the projects you sew with Janome sewing machines. To you want great results using placement prints with your Janome DC2013, just try these tips. Placement prints are fabrics made with a single large printed or woven motif or graphic in the fabric. Due to the larger size of the motif, the image is designed to be positioned as a focal point on whatever garment or item is sewn on sewing machines with this fabric. Placement graphics can be as detailed as an ornate decoration or as simple as a block of text. The central design can be added to the item after assembly, such as when a t-shirt is screen printed, or the item can be constructed around a design that's already made into the fabric. In either case, the positioning of the design is critical and the one detail that can make working with these fabrics challenging. View Entire Bolt Width - When coming across a placement print that you like, roll out the fabric to see the entire bolt width. Look at how much actual space there is around the design for you to work with. If you're buying online, make sure there is an image of the entire width and the dimensions of the fabric and design to get a clearer idea of what you'll be working with. View Pattern Pieces Against Fabric - Before you buy, bring your pattern to the fabric store and lay the pieces out over the design. Get an idea of how the focal graphic will fit on the item you plan to sew. You can figure out ahead of time if the design is too big or too small for how you envision it appearing on your item. Consider Creative Placement Options - Conversely, if the motif doesn't fit directly in the middle of your pattern yet you like it and really want to use it, is there another way it can be aligned? Not everything has to be straight and center. When skillfully positioned, focal designs can look just as good off to a corner or aligned to some physical feature of whatever you're going to sew with your Janome DC2013. View How The Design Falls - Last of all, if you're making clothing, hold the fabric against yourself and look at it in the mirror to see how the fabric falls and what the focal graphic looks like. Make sure you like how it looks draped and folded as this is close to how it will look once the garment is worn. If you get through all these steps and still like the print for your project, just buy it and get to work. 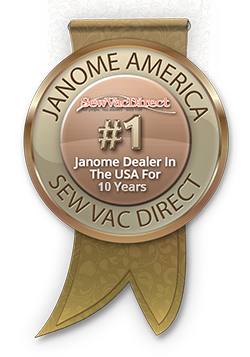 Whether you are sewing a tote bag, blouse, or set of kitchen curtains with Janome sewing machines like the Janome DC2013, the important detail when working with placement prints is positioning the motif well. Choose the best motif and find a good way to use it by working through these steps first. With the right positioning, anything you make with sewing machine and placement print fabric will look fabulous!